From Ancient Roman landmarks in the historic center to the bustling bars of Trastevere, Rome encompasses several diverse neighborhoods. Explore beyond the historic center to discover botanical gardens, quiet churches, local markets, and contemporary museums. Here are a few options for getting to know Rome in the Centro Storico and beyond. Rome’s historic center houses famous landmarks of Ancient Rome. Join a guided walking, biking, or bus tour to learn the history of attractions such as Piazza Navona, the Colosseum, Campo de’ Fiori, Villa Borghese, and more. In addition to ancient ruins, this district boasts hotels, restaurants, markets, and cafés. 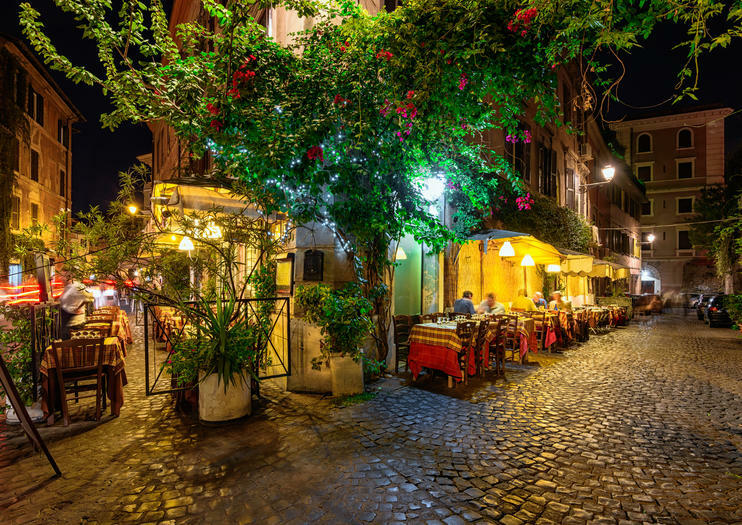 Cross the Tiber River to reach Trastevere, a neighborhood full of narrow cobbled streets, small pizzerias, wine bars, restaurants, and bakeries—making it an ideal area to explore by foot when hungry or thirsty. Several smaller landmarks include a botanical garden and the Basilica di Santa Maria, one of the oldest churches in Rome. Dominated by St. Peter’s Square, the Vatican is home to some of Rome’s most popular attractions, including the Sistine Chapel with its famous ceiling painting by Michelangelo. Explore the Vatican Museums, visit St. Peter’s Basilica, and wander through the Vatican Gardens. Rub shoulders with Romans in Testaccio, a neighborhood known for its food market. Join a guided food tour to see stalls full of fresh produce and taste street food snacks, including a range of sandwiches. This area is also home to the MACRO Modern Art Museum and many restaurants and bars. After a visit to the Colosseum, explore one of Rome’s bohemian neighborhoods. Unique shops, small wine bars, and family-run restaurants make Monti an ideal area in which to wander and get lost. Historically this district had a seedy reputation, but it now attracts artists and students with galleries, bookshops, vintage stores, and cafés. Venture north of the Vatican and into Prati to see a polished residential neighborhood with lots of options for shopping, restaurants serving traditional Roman fare, and bars with live music. Market lovers may also want to explore the many stalls of Mercato Trionfale. Capped at only 12 people, this small-group tour of Rome’s Colosseum includes exclusive access to the arena floor and underground dungeons, off-limits to regular visitors. You’ll also make guided stops at the Roman Forum and Palatine Hill for a full overview of day-to-day life in ancient Rome. Skip-the-line admission at all three sites is included. Get a taste of Rome’s Testaccio neighborhood, the center of the local food scene, on this 4-hour tour. With a foodie guide, you’ll enjoy nine tastings of regional cuisine as you walk through the neighborhood to meet vendors and learn about secret Roman recipes. From gelato to cheese to pastries to fresh pasta, you’ll enjoy the best of Italian food. Select a departure time when booking. Explore the Vatican Museums, including the Sistine Chapel, without the usual hoards of tourists during a 2-hour nighttime tour. Offered seasonally on Fridays evenings, this exclusive experience is not to be missed. With fewer visitors to content with, you’re able to better appreciate the iconic art and architecture. Headsets are provided, so you can hear your guide clearly while enjoying a 360 view of your surroundings. The Vespa motorbike is a post-war icon famous across the world as a symbol of Italian style and design, and remains popular throughout Italy and beyond. On this morning or afternoon Rome tour, spin off the tourist trail by vintage Vespa with your guide at the controls, and explore the backstreets of Rome in style. Cover the ground with ease, and learn about traditional Italian crafts during stops at two local artisan workshops. Explore a lesser-known side of Rome on a 2.5-hour, private walking tour through the district of Monti, where you’ll find a wealth of local culture and historic landmarks. Follow narrow, car-free lanes to churches with masterpiece artwork, medieval towers, and bustling plazas, as your guide shares stories about daily life, history, and more. This 2.5-hour Monti walking tour includes all entrance fees, is priced at a flat rate for up to 15 people, and offers the flexible, personal experience of a private guide.